It was the time to say bye bye to Bikaner , my Tour of Rajasthan was reaching its end stages and the next destination was Mandawa. I had heard a lot of this place specially from my brother Chirag who had insisted and made me to include Mandawa in my tour. Sight seeing of Bikaner was over , we had visited Junagarh Fort , Laxmi Niwas Palace and Camel Breeding Farm at Bikaner , which were the only short listed places at Bikaner in my trip. Now i was back in my car and had left for Mandawa. It was going to take some 6-7 hrs to reach Mandawa from Bikaner , i was going to visit the Shekhawati region of Rajasthan which includes Churu , Fatehpur , Mandawa and all places are known for their big centuries old Haveli’s of Marwari’s who had left these ancestoral haveli’s of them and had shifted to different parts of India. After some 4 hrs we reached to the first halt of our , at Churu , considered as one of the most coldest and the hottest place of India and it had given me the same experience. It was somewhere near 40 degrees when we reached Churu. 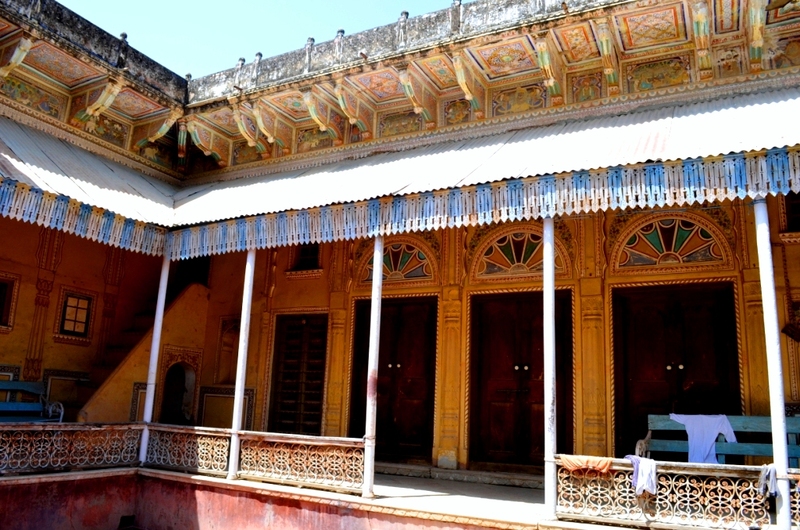 What else to say , this first look of churu haveli had struck my mind for sometime. 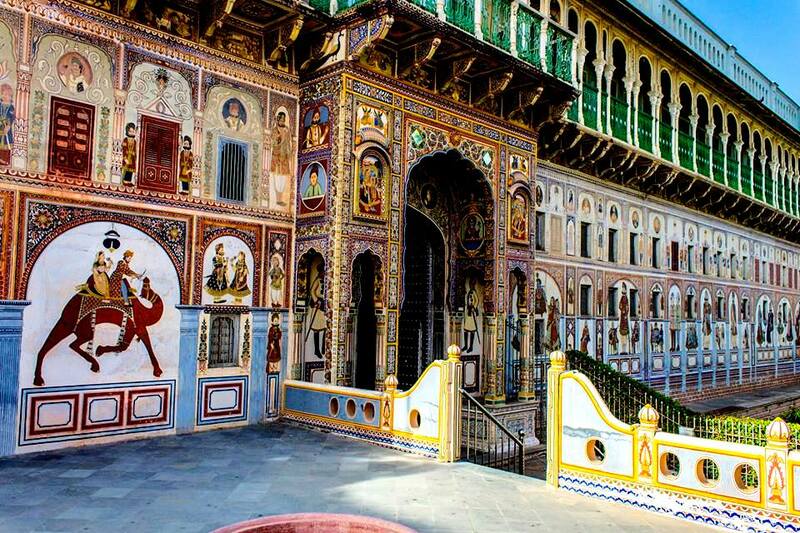 Centuries old this haveli , but its frescoes still looking as fresh as they were made the day before only. I had started loving the suggestion of my brother and gave him a call to thank him for it. 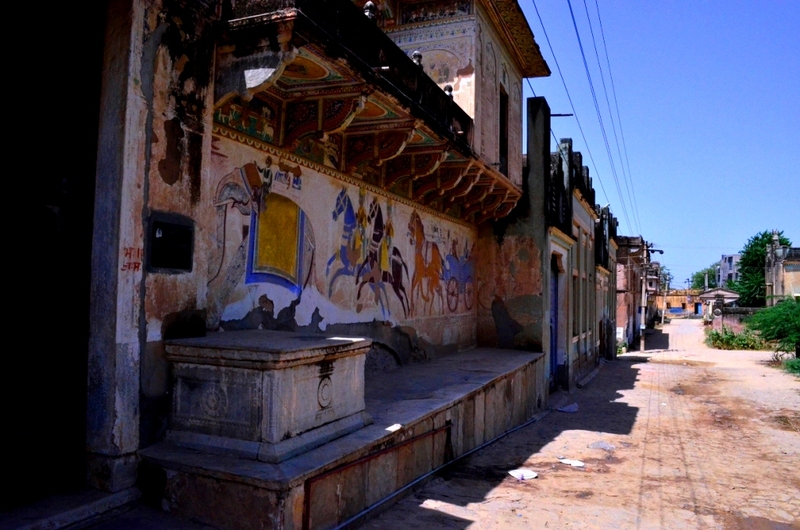 We moved forward towards Mandawa , but there was going to be one more halt at Fatehpur and i was getting excited more and more and wanted to reach Mandawa as early as possible , but it was still 2hrs away and i knew that i will had to wait for the next day to have the glimpse of Mandawa Haveli’s. Fatehpur had arrived , we stopped for a while , tried to look for some Haveli which is open and entry is allowed but unfortunately had to suffice from outside only. 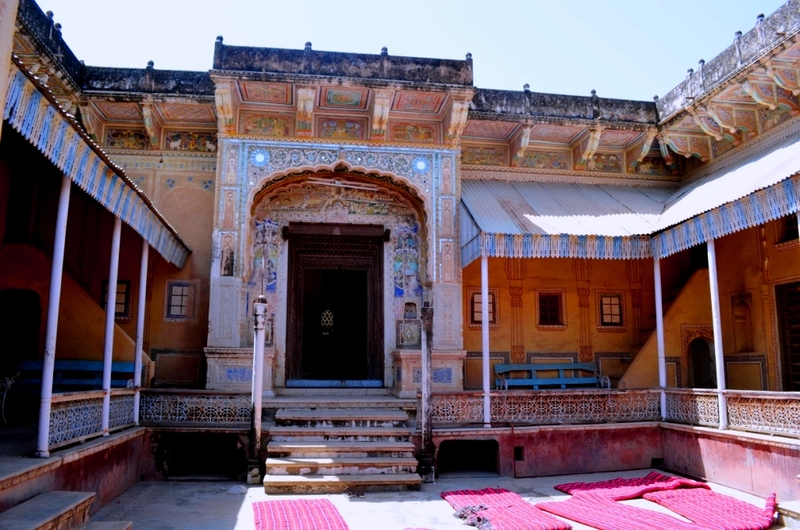 Hanuman Prasad Nevatiya Haveli of Fatehpur , wish i could have been able to get inside it. 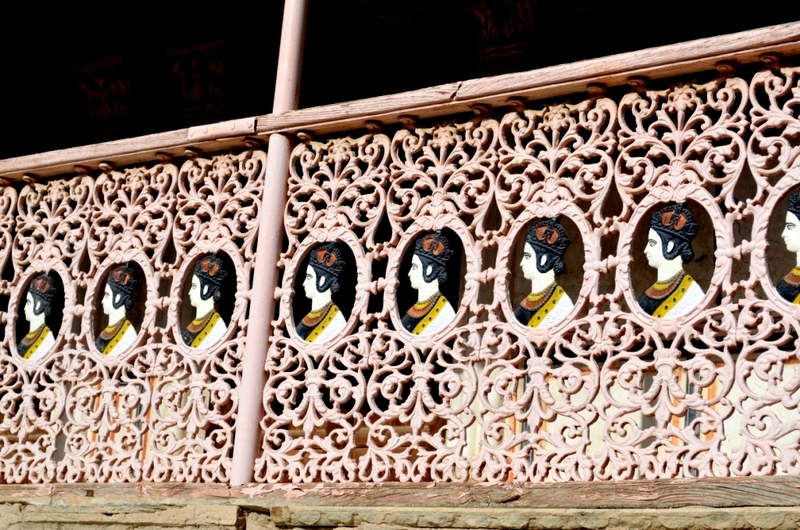 Once these Haveli’s were inhabited by the Marwari’s of these places , who comes in the richest of peoples of India in present time. 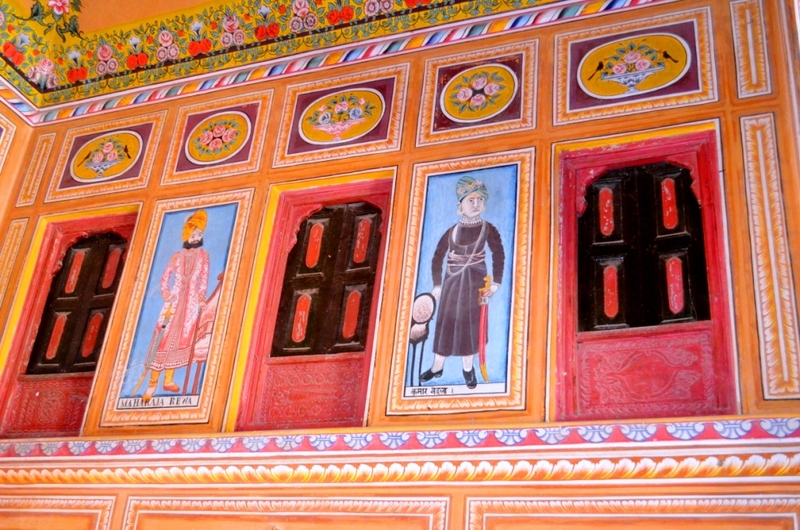 They had the knack of showing there wealth by decorating there homes by these frescoes , that is why in this area every haveli gives competition to each other. A short halt at Fatehpur , and now again on the road towards Mandawa. On the way this Water well came in front of us and forced us to stop for a while , my greedy camera was shouting from his backpack for the click. Some Ganeshdass Gorakhram Kedia in 1977 had donated this land and water well for the people of Fatehpur. 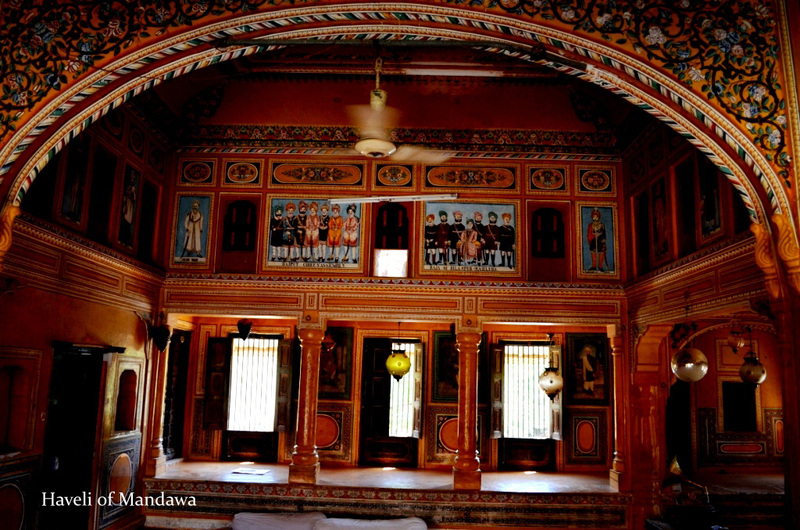 Now Mandawa was just 30min away and it was 5.30pm and sunset was just an hour away and it was going impossible for me to visit the Mandawa Haveli’s the same day only. Atlast we reached and checked in at Heritage Mandawa , who had offered us a free stay and in itself was a century old haveli like other haveli’s of Mandawa , it was turned into Hotel now. Sun was down and now i had no energy to go out , so it was best to go for bed and start the next day tour early. Second day had started very early at Mandawa for me , I was going to see the majestic Mandawa Haveli ‘s and the fort of Mandawa “Castle Mandawa”. Had a nice breakfast at Heritage Mandawa , and we left for the sight seeing of Mandawa. Though waiting was not over yet , we were bit early to leave and Haveli’s generally open by 10.00 Am and this 1 Hr costed me some Rs 4000 as my wife went for shopping spree and in one hour she bought some dozen’s of “Laakh Ki Chudiyan(Bangles)” for whole family , Mandawa is also famous for his Laakh Ki Chudiyan(Bangles) , though Jaipur is also famous for it but as my wife told she got lot more better stuff at less price here at Mandawa. Now the right time had arrived and we started our journey towards Haveli’s , there was no need of car as it was better to be on foot in those narrow streets. This street had brought me to some other period , i was living my life in some other time suddenly. I had reached this street , where hardly any movement could be seen , i was looking for any Haveli in which i could enter but for that also i have ask somebody , but where to find that somebody. Then i decided lets cross the line and enter the Haveli, may be somebody is inside. There were signs of somebody living their , doors were open , main door of Haveli was also unlocked , i tried to look for somebody but nobody came hearing my voice , i had crossed the line by entering somebody’s home without asking anybody and again crossed the line and clicked some pictures and left in lookout of a Haveli where i could find a guard who could tell me something about that Haveli. Atlast i reached to “Sneh Ram Lada Haveli” , their i found the guard who very happily welcomed us and invited us inside the Haveli. This Haveli was turning into a museum from the next year , so some renovation work was going on , but not touching the frescoes. My Curiosity towards these frescoes was increasing with every passing minute , which that guard realised on my face. He told us the technique why these Frescoes are still fresh and young after so long. “These frescoes are not like paintings, infact they are like plaster on the wall and the designs were made when wall was freshly built and it had moisture in it. Natural colour were used in making the plaster and as the wall gets dry the colour would come according to the dryness of the wall , the late the dryness the darker the shade of colour would come”. 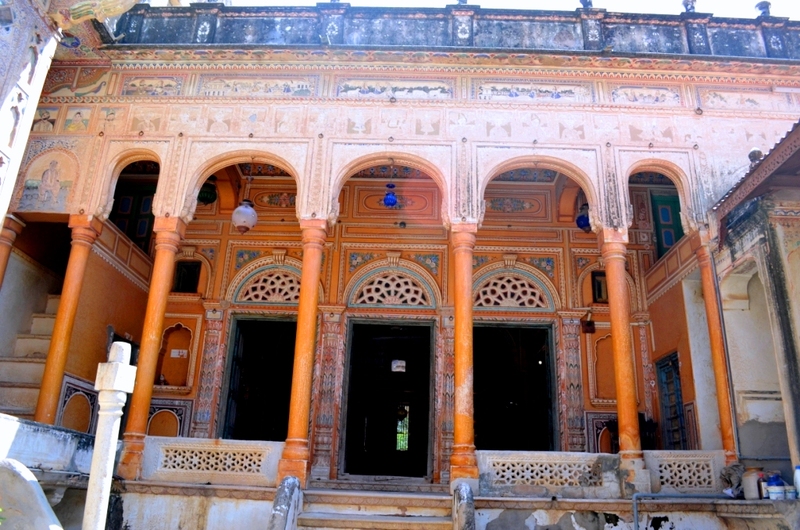 He said , from next year the owner of this Haveli is turning it into a museum. Then my next question came , who is the owner? 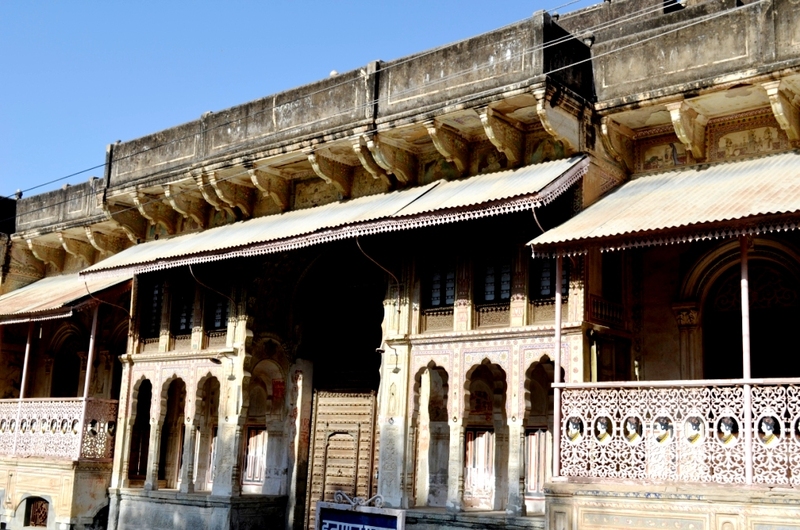 He Replied “Sneh Ram Lada” , i was not asking the man who built this but the present owner , and his answer for this was more surprising ” Now there are some 40-50 owners of it “, all in the lineage of Late Sneh Ram Lada are the partners of this Haveli. This had solved a puzzle which was troubling me from the time i had reached to Mandawa , Why dont they sell these Haveli’s? , now i had got the answer , how to get yes from every partner who owns the haveli , and this case is with almost every haveli of this Shekhawati Region. This place has got the Haveli’s of Shri G.D. Goenka and Poddar’s as well , yes they belong to this village and left this place long time back , though there Haveli came on the way but Goenka’s haveli has been turned into a Restaurant now and i was not in mood to give a visit to it. 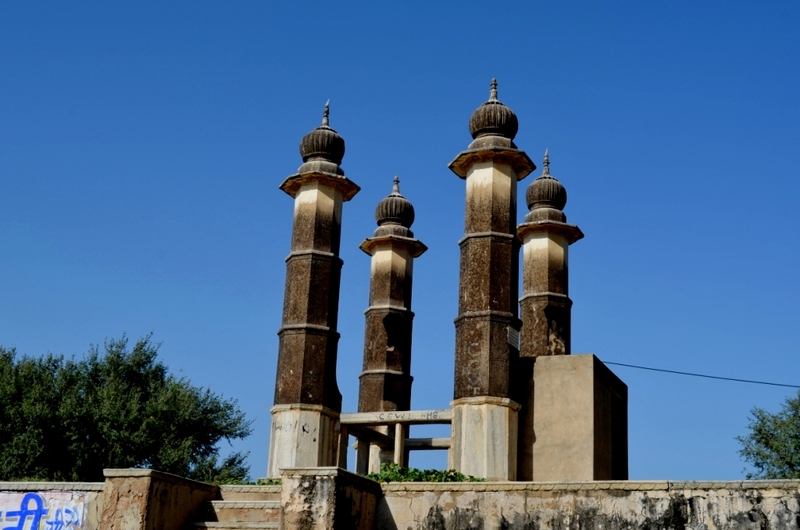 My next destination was waiting for me , fort of Mandawa ” Castle Madawa ” , wait for it. I had seen Haveli’s in Delhi as well in Chandni Chowk , they are also huge and very nicely carved designs could be found on it , infact they are now under ASI as Heritage property but these haveli’s are different specially there frescoes make them unique , but my visit to these haveli’s of Mandawa was something which i would visit again and again as lot is still left. you write ‘ It was going to take some 6-7 hrs to reach Mandawa from Bikaner’. Its that long from Mandawa to Bikaner?? GoogleMaps says 3hours..? I’m just planing a Rajasthan journey and it would be good to know about it.